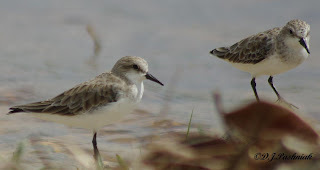 It's very frustrating when there are thousands of shorebirds around right now and the weather is too bad to go out and see them. We've had only intermittent rain recently but the winds have been extremely strong. My kayak is 4 meters long and it's not easy to get it onto the car roof racks when there is a strong wind. 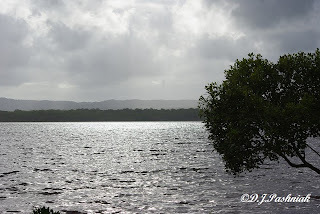 This morning was still gray and overcast but it wasn't raining! The wind had dropped overnight and the tide was high very early. It was definitely worth a try for at least a close roost site. I kayaked around to the roost we call the Airport Roost but the wind was picking up by the time I got there and this roost is very exposed. There were 3 Common Greenshanks which took off before I could get anywhere near and a couple of Pied Oystercatchers on the far end of the sand spit. There had recently been many more birds roosting there as I could see bird foot prints all over the sand. I turned around and paddled up Mullens Creek to see if I could find any of the Grey-tailed Tattlers which sometimes roost in this area. 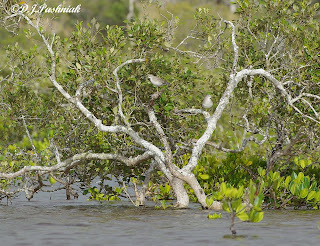 I found a small group of 5 birds roosting in open Grey Mangrove trees. 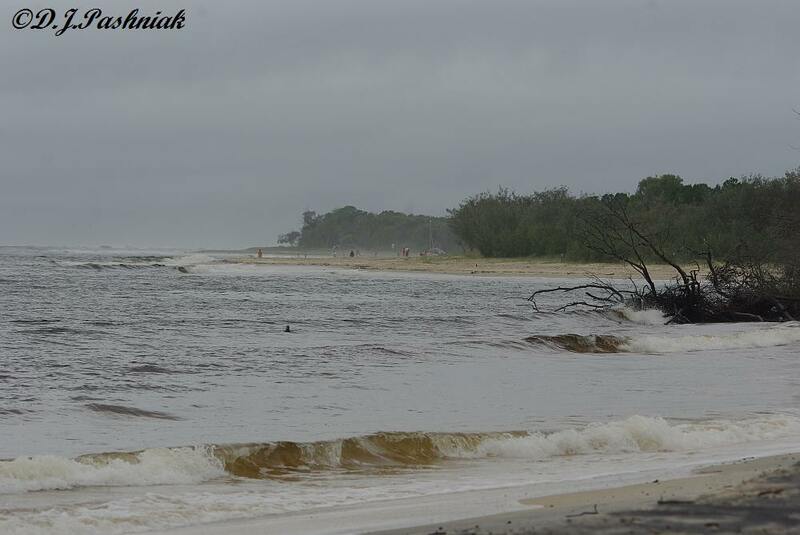 By this time the wind was getting stronger and it was quite a hard paddle to get back to where I had left the car. Here's hoping for some fine and still weather - Soon! Rainbow Lorikeets come into my garden most days. 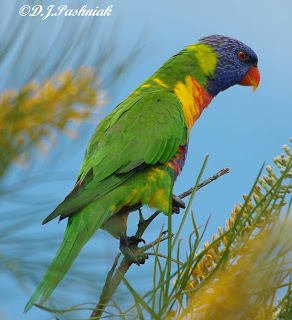 The other day there was a very strong wind and this bird sat on a very small top branch of the grevillea tree. The bird swayed with the wind and flapped its wings - apparently to keep its balance. Unfortunately, I didn't have the camera set fast enough to take out all the movement blur - but I still got good views of the beautiful under-wing colors. It ended up looking rather like a rumpled feather duster! A friend told me a few days ago that they had been up to Boonooroo and seen good numbers of shorebirds roosting there right in front of the houses on the shoreline. I decided to go up and see for myself this morning. However, I had forgotten just how little shoreline is left when the tides are high. 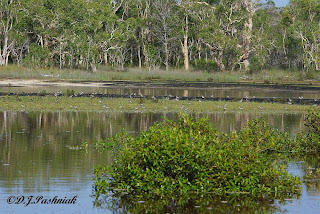 I went to the places where I had previously seen the shorebirds and all I saw were huge flocks of birds flying elsewhere. I don't know this area well so I drove down every road that I could find that went towards the shoreline. Eventually I found the birds. They were roosting right in front of some houses. 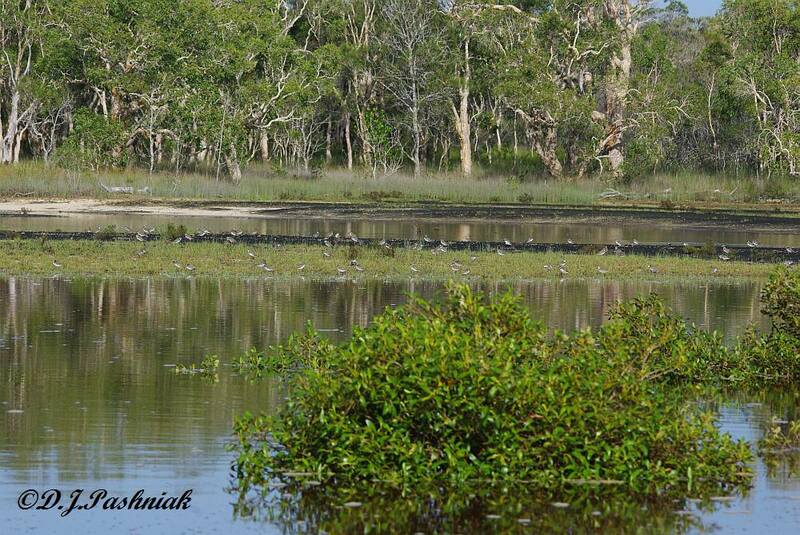 The water was a little shallower and the grass at the edge was low enough that the birds could get up on to it. 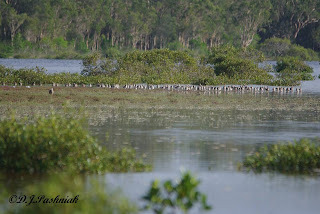 There was a huge flock packed tightly together. Most of the flock was made up of Bar-tailed Godwits (Limosa lapponica baueri) but there were some Eastern Curlews (Numenius madagascariensis) standing further out in the water on a sandbank. 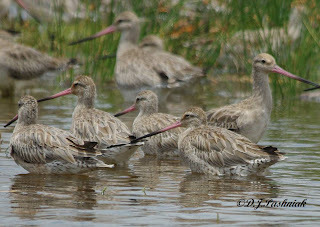 The water was not too deep for the Curlews but the few Godwits with them were not comfortable with the water depth and soon flew off. 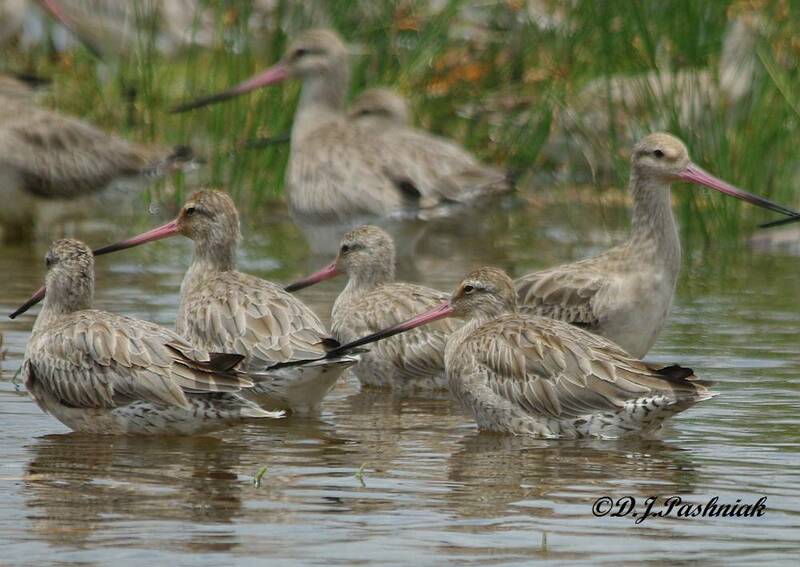 Even close to the shoreline the Godwits looked almost as if they were swimming. There were a number of Great Knots (Calidris tenuirostris) also packed in tightly with the Godwits. 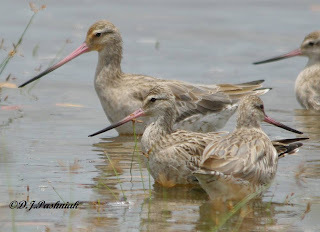 Great Knots look only a little shorter than the Godwits but the plumage color is slightly different and their beaks are straight and black. Over the last few days I have been hearing the sounds of young birds in the trees at the back of my yard. When I went out to investigate the other afternoon I found two young Pied Butcherbirds (Cracticus nigrogularis) sitting up in the tree. 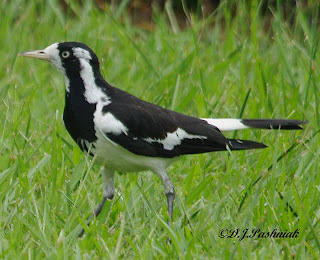 The adult bird flew off as I appeared but the two youngsters sat and watched me with what appeared to be great interest. 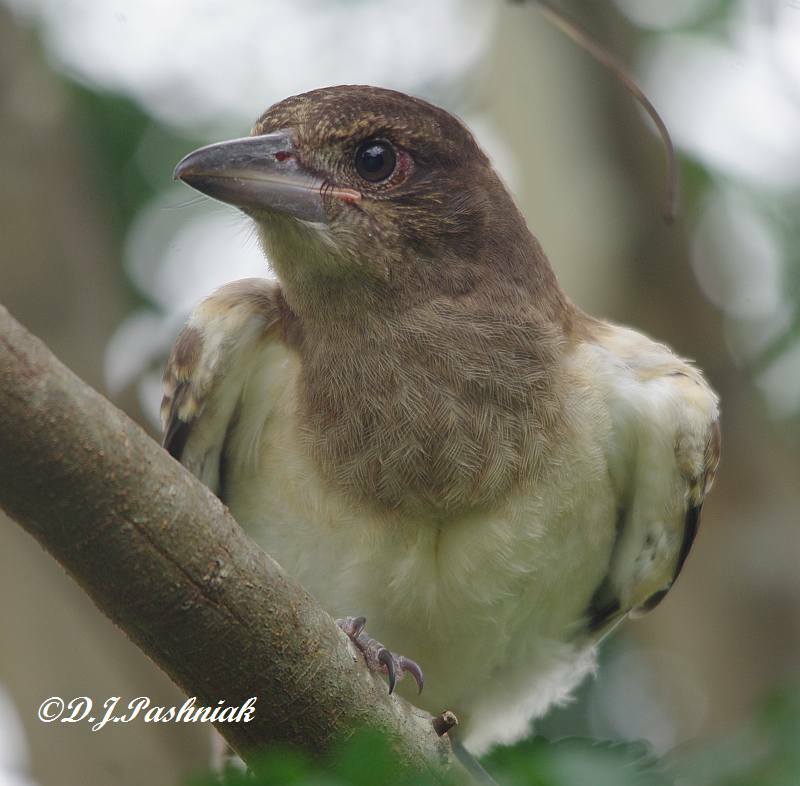 After watching me silently for some time one of the young birds began to sing a few rather tentative notes of the adults' song. 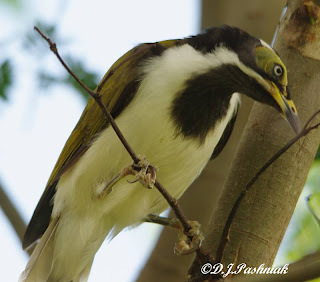 A young Blue-faced Honeyeater (Entomyzon cyanotis) did not like these two young birds so close to territory that it claimed for itself and came down into the same tree and gradually hopped closer. 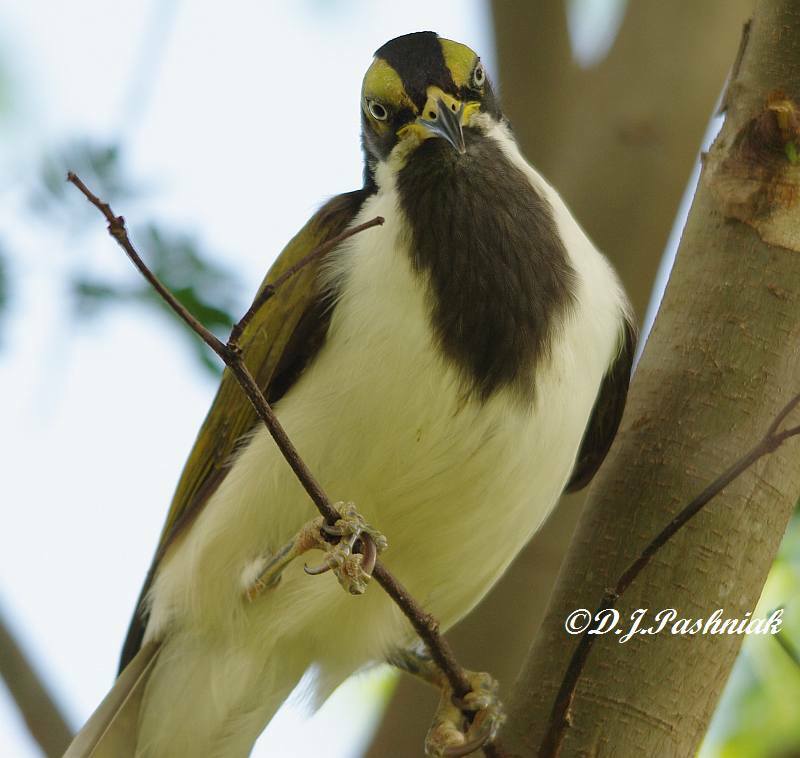 This bird was a young one as the two patches over its eyes were still a greenish color rather than the bright blue of the adult. It hopped down the tree. 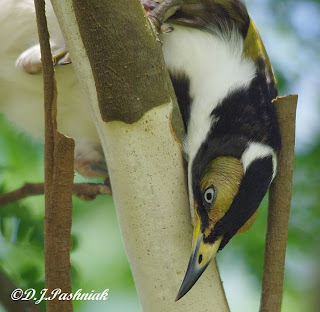 It peered down from the branch above and clicked its beak aggressively. 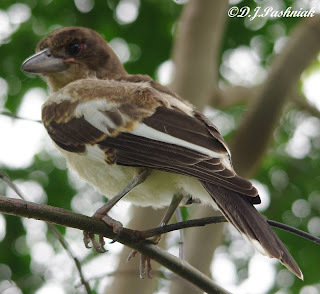 It eventually even perched on the same branch. 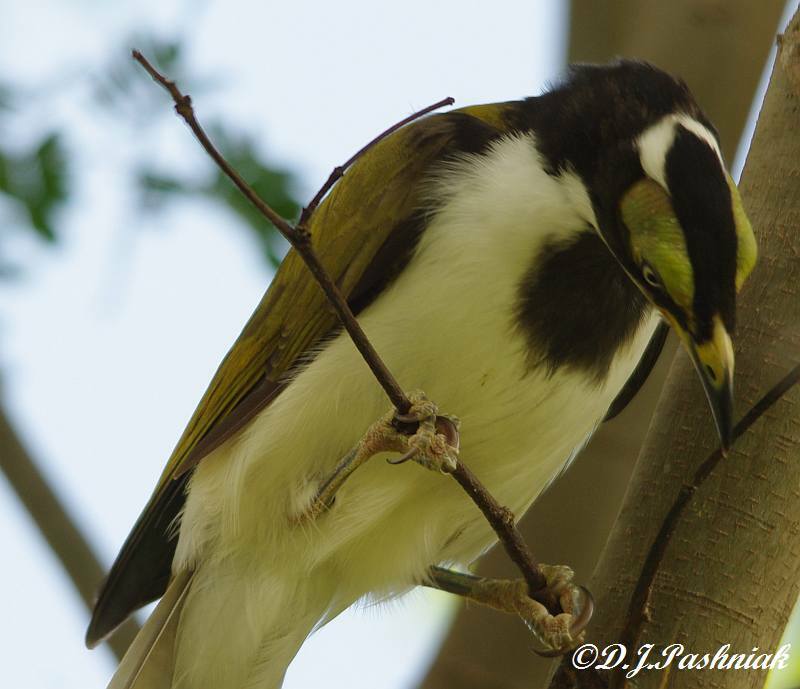 The Butcherbird ignored it, and, without the group to help it, the Honeyeater eventually gave up and flew off. We've had several days of dry weather but unfortunately there are still lots of gray clouds around. 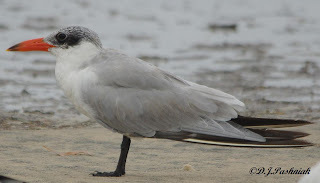 When I walked out to the Mullens shorebird roost this morning and yesterday morning I saw lots of birds - but gray skies and gray/brown birds on gray/brown sand don't make for great photos. 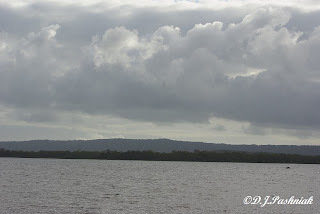 There were lots of birds on the far side of the bay. 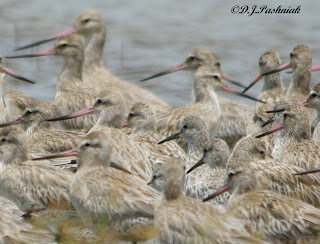 The larger birds - Godwits and Curlews - were further down the bay where the water is deeper. Many of the smaller birds were on a sand bank at the shallow end of the bay. 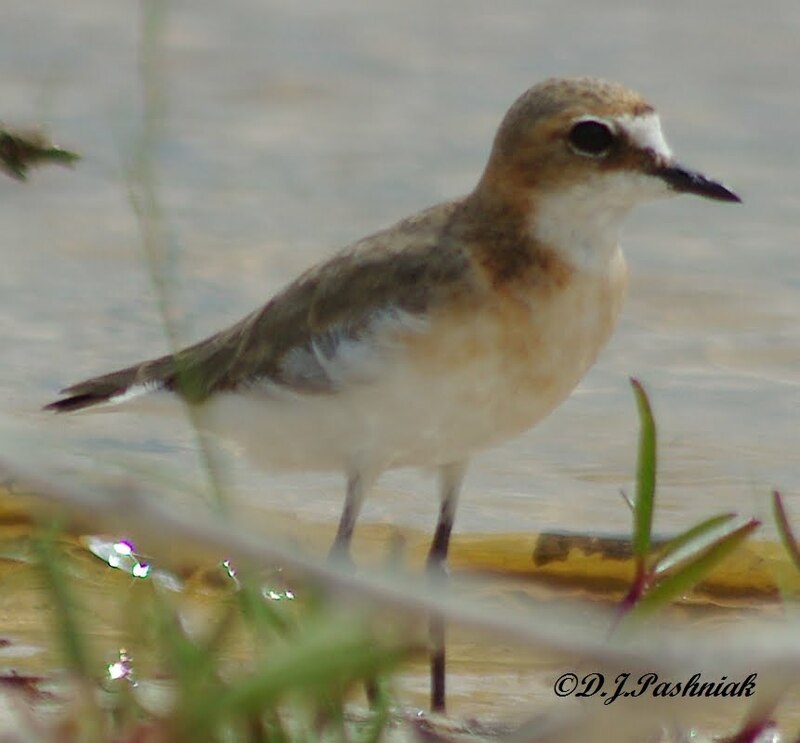 There were large numbers of Lesser Sand-Plovers in among the other birds. 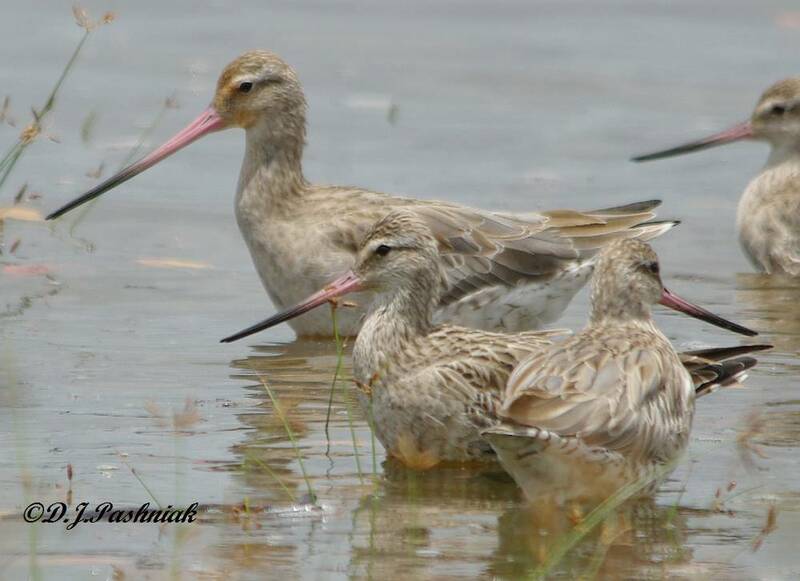 They were standing in the shallow water in front of the Bar-tailed Godwits. They were also out on a sand bank with some Pacific Golden Plovers. There was also a small flock of Great Knots. There is still a lot of fresh water running into the bay from the recent heavy rains. 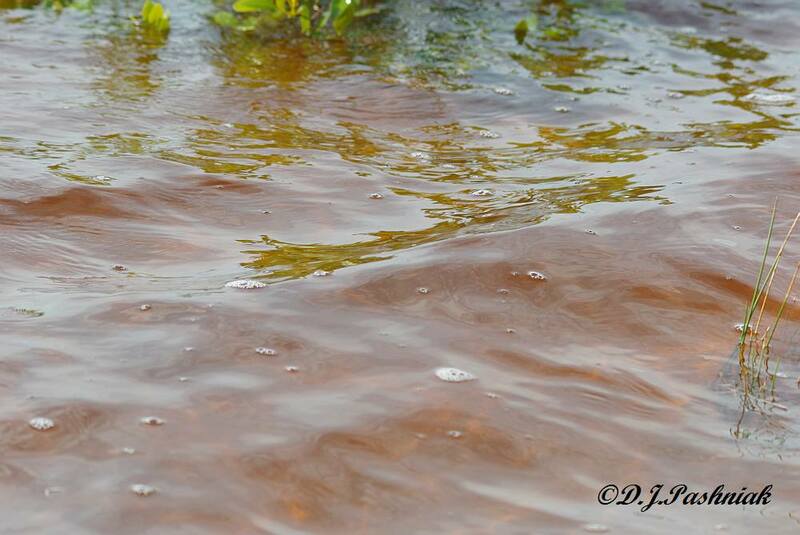 This fresh water is stained with the vegetation it filters through and comes out colored dark orange/red. 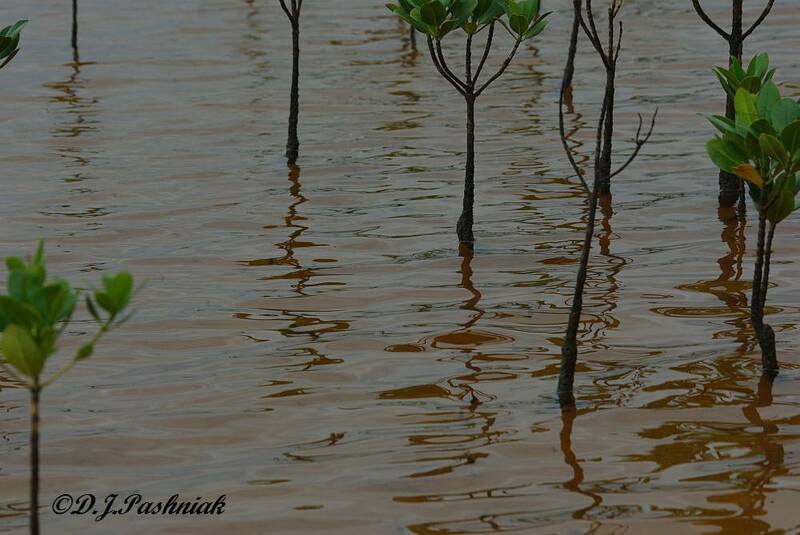 I am still trying to get a photo that shows all the tints of red as the water gets deeper out from the shoreline. 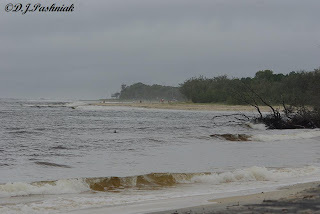 Yesterday was again gray and showery but since the rain was not constant I decided I would drive over to Inskip Point and see what the rough weather had done to the area. There were very few campers around and even the point had only a couple of cars and fishermen out at the edge of the sea. 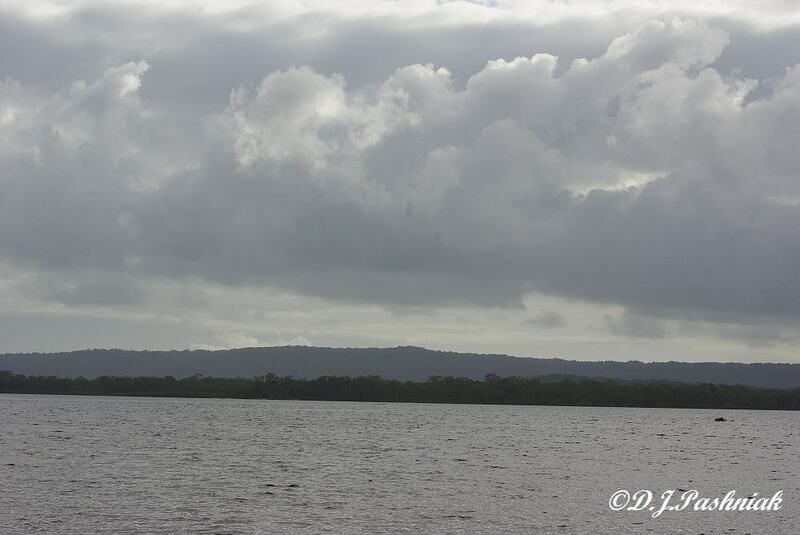 This photo is taken looking along the channel out towards the open ocean. 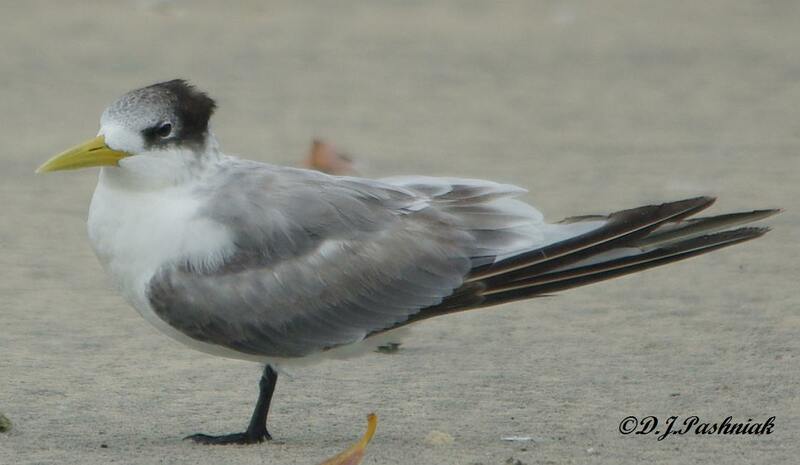 The only birds were a few gulls and terns. 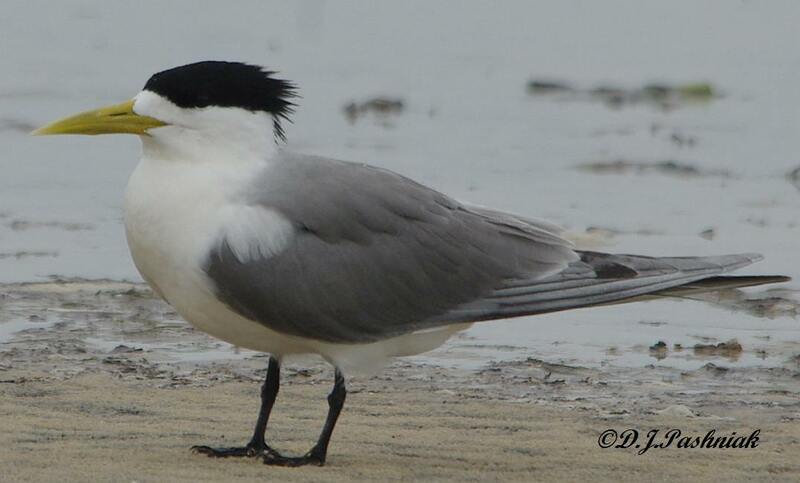 This Crested Tern (Sterna bergii) looked very smart in breeding plumage. This is a one year old Crested Tern in non-breeding plumage. 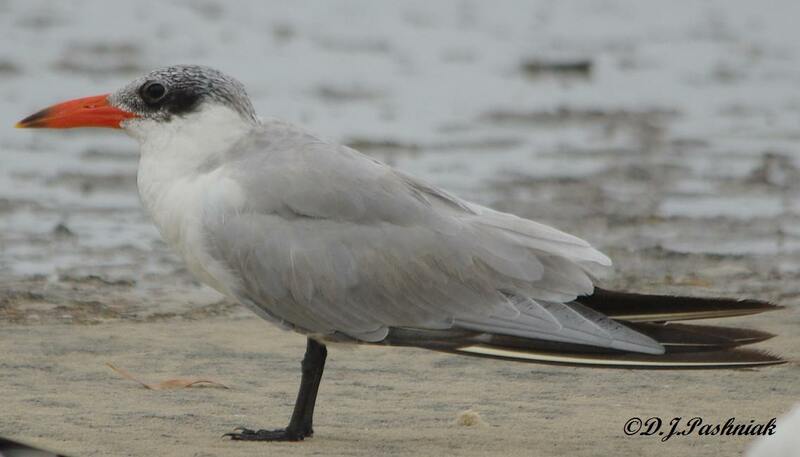 There was one Caspian Tern (Hydropogne caspia)- in non-breeding plumage. 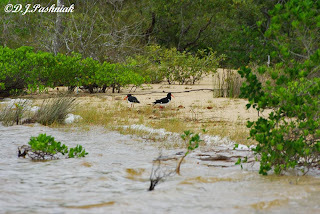 Caspian Terns the largest of all the terns we see. 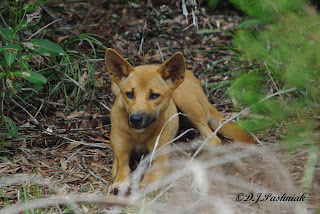 Driving home between Inskip Point and Rainbow Beach we saw this dingo on the road. As the car approached it disappeared into the brush on the side of the road. 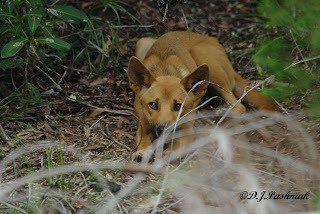 There was no traffic around so I slowed to a walk and we carefully looked behind every bush. The dingo was sitting just off the road between a couple of bushes but clearly visible from the right angle. It was not at all worried about the car stopping on the other side of the road and I even had time to change from my wide angle lens to the long lens. 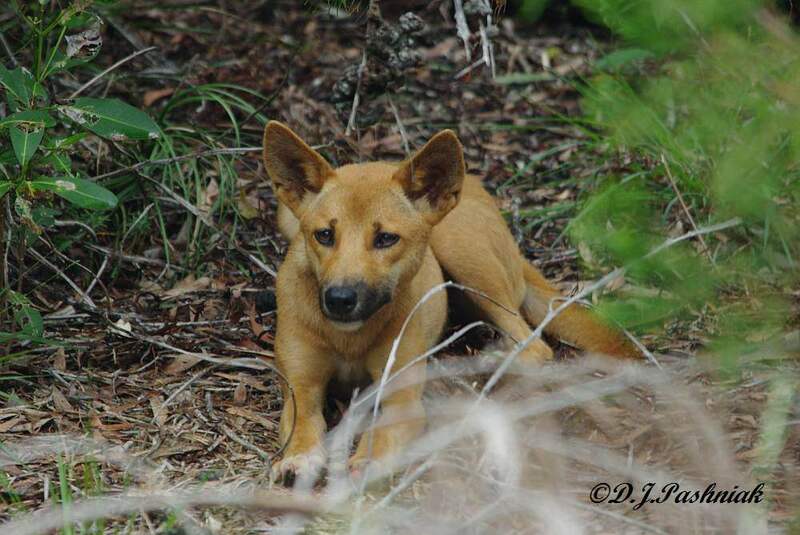 Very few dingos here on the mainland are pure-bred and I have no idea how much plain "dog" went into this one's breeding. Magpie-larks (Grallina cyanoleuca) are very common around my yard. 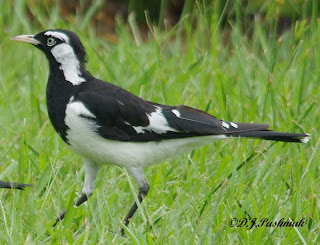 I often find them walking over the lawn and hunting for grubs and insects. 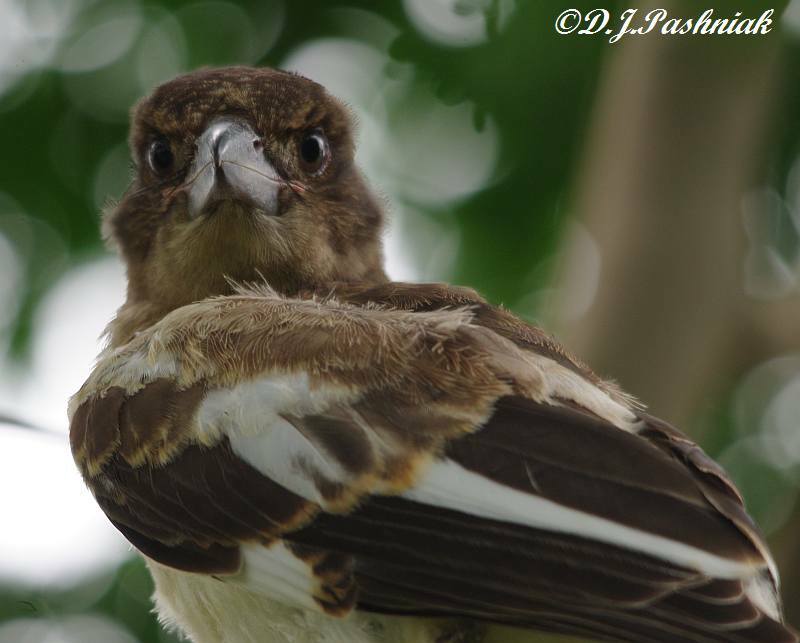 Right now there is a pair with two very noisy juveniles. 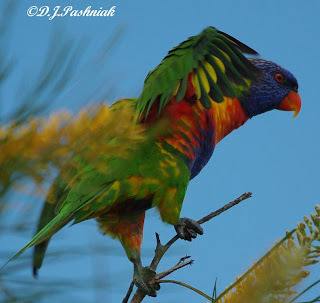 Last year I could see their nest up in the big pine tree next door. This year they have hidden it better and the first I knew about the young ones was hearing their hoarse whistling as they demanded that the parents fed them. This is the second lot of young ones that have been raised in that tree this year. Now they are following the parents around the yard and they are even noisier. 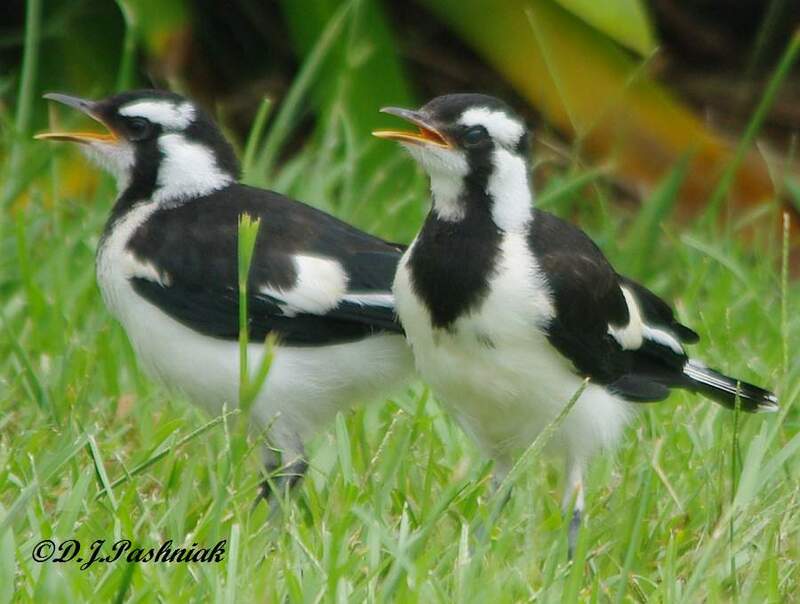 Males, females and juveniles all have a different pattern of black and white plumage. Here are the juveniles standing together and demanding food. This juvenile is following the adult and not stopping its screaming unless there is actually food being stuffed in its mouth. After a few days of fine weather last week it has started to rain again and this time it has been right over our area. 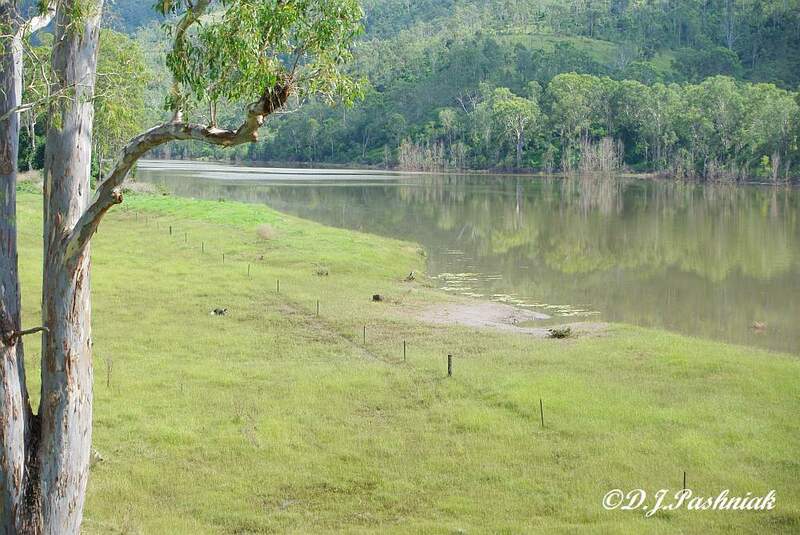 We have not been quite so bad here on the coast but just inland it has been extra heavy - the weather bureau says there was over 300mm of rain in one 24hour period in the upper part of the Mary valley. Of course all the streams and rivers are in flood. There are major flood levels expected in both Gympie and Maryborough later tonight and tomorrow. Right here on the coast the only streams are short ones that drain the immediate area so I don't have to worry about big floods from them. 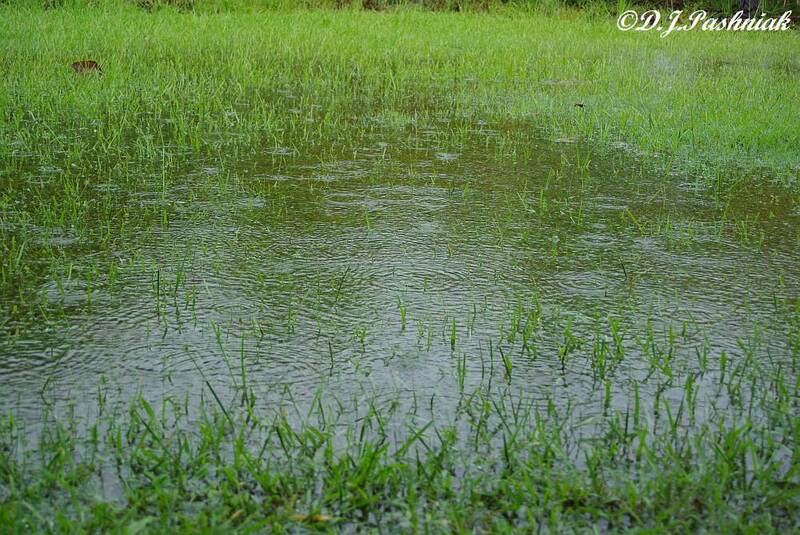 My lawn has turned into a paddling pool again. It's only a week since I mowed it but the grass grows so fast in these conditions. 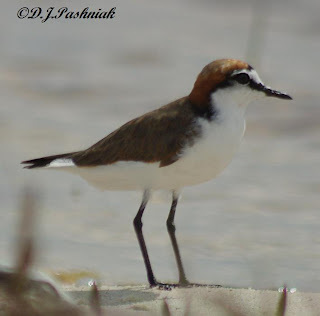 While I was photographing a mixed group of Red-capped Plovers and Red-necked Stints on a sand-bank at the Mullens roost the other day I noticed this bird with unusual plumage. It looks to me like a Red-capped Plover except for the red down its front. The water in the bay is deeply stained with the tannin from the fresh water that has been flowing into the bay from all the rain we have been having. 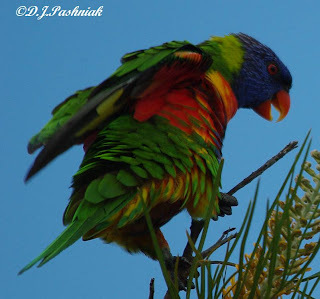 I thought at first that the color on this bird might be stain but it seems unlikely with such a clear line of marking under the throat to the belly. 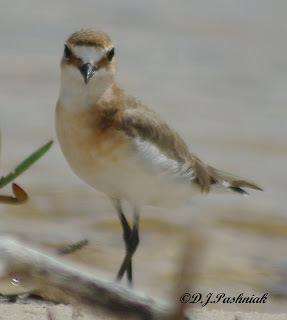 Also none of the other Red-capped Plovers showed any similar markings - and I estimate approx. 30 other birds with this one. I took a number of photos of this bird after I noticed the marking. 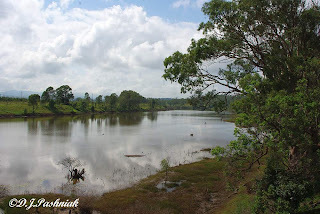 Sorry that the photos are not as sharp as they should be - I was having trouble with the auto focus on the lens and was trying to use the manual focus. Added Info! 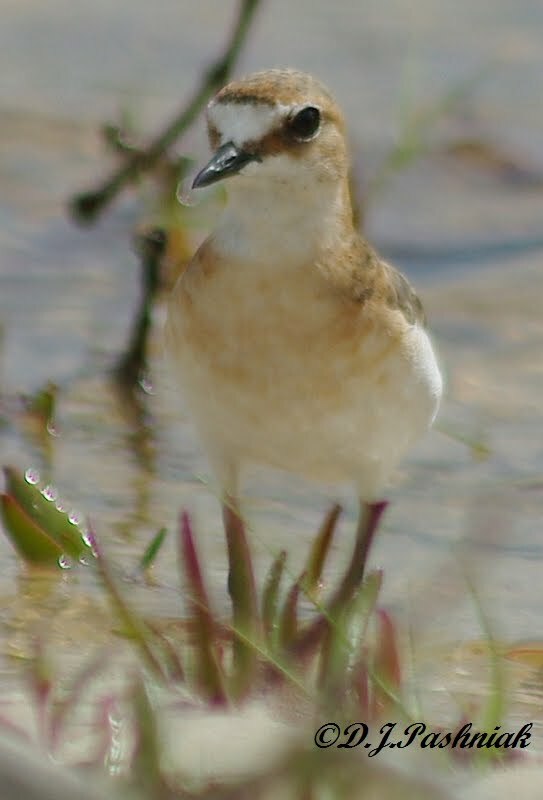 After several very helpful pieces of information from various readers the consensus opinion is that this is a Red-capped Plover with aberrant plumage. 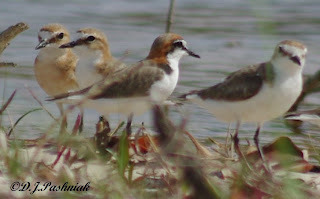 Such differences in plumage can occur and there are records in HANZAB of aberrant plumage in Red-capped Plovers which sound quite similar to the bird which I photographed. Thanks especially to Jill Dening for helping with all this. Yesterday was a beautiful day - bright and sunny and a very high tide in the morning as well. 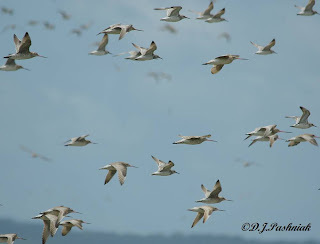 I took the kayak down to the bay and went around to the Mullens shorebird roost. However, the tide was so high that there wasn't anywhere left for the birds to roost so they had all flown off somewhere else. I paddled down to the far end of the roost where there is sometimes a little sand spit left out even at very high tides. This is the second entrance to the roost and has bollards and a notice to discourage 4 wheel drives from entering. There was a mixed flock of Red-capped Plovers (Charadrius ruficapillus) and Red-necked Stints (Calidris ruficollus) roosting together and I was able to get quite close without disturbing them. Red-capped Plovers stay in Australia all year. This is a male. 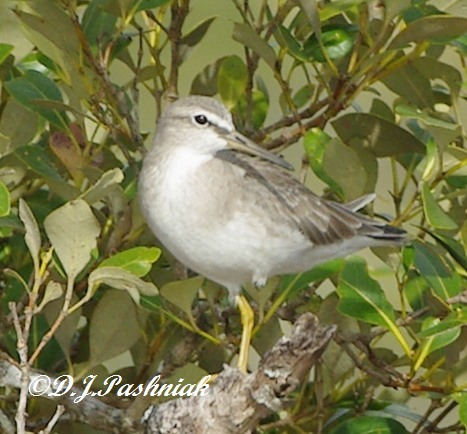 Red-necked Stints spend the southern summer here after breeding in NE Siberia and W Alaska. 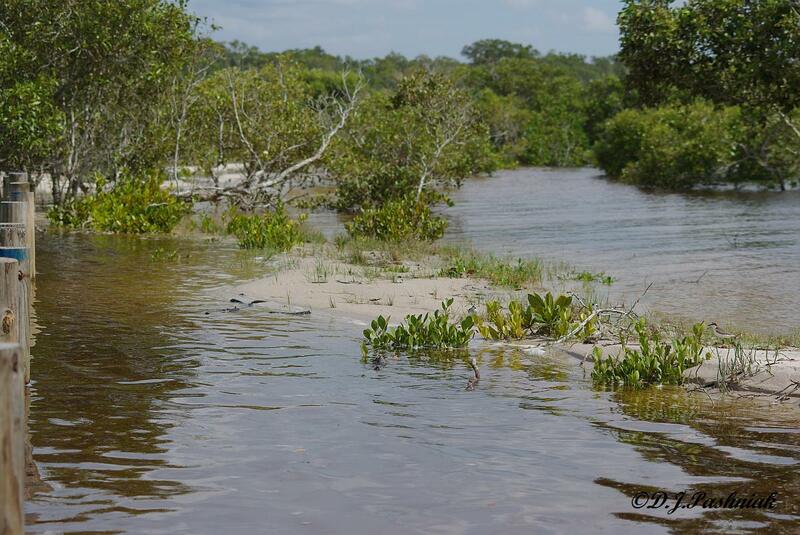 This is a mixed group standing among the small plants and the debris washed up by the tide. 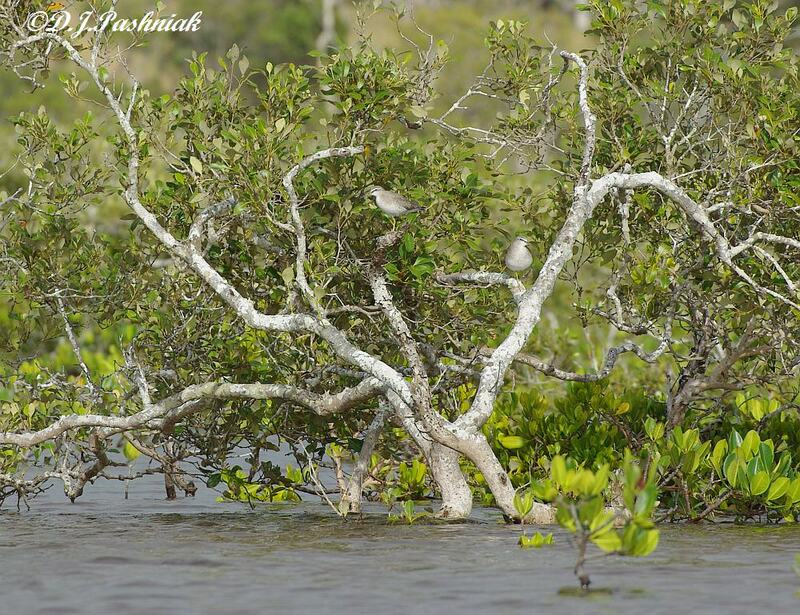 There is one bird in this group that has a slightly different plumage. More about this one tomorrow! What happens when you mix lots of water, frequent thunderstorms, and a very "crackly" phone line? NO INTERNET ACCESS!! I have been off-line for nearly two weeks and have felt completely cut-off. To add to the grievances it has rained and drizzled and rained again. 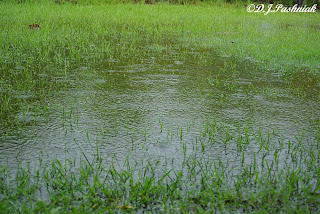 I have no spectacular flood pictures - just mud oozing up between my toes as I walked anywhere around my yard - and you really can't photograph that! I measured a total of 537mm for December right in my backyard. 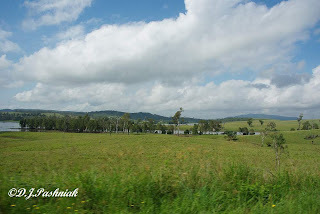 Compared with other parts of Queensland we got off very lightly. The roads in to Gympie and also to Maryborough were cut for a day and the supermarket shelves were looking empty - especially for fresh bread and milk and eggs. The parking lot was filled with out-of-town cars so I guess there were a lot of people making the best of wet camps until they could get through the floods and start home. The last few days we have had some sunshine which has started to dry out the ground. However, the 6+mm of rain we get most nights is enough to slow down any drying out that the sun can do. I had to go down to Esk today and it was very interesting to see just how much water is still coming down the rivers and streams up that way. Of course the paddocks are very green and in many places the cattle were moving through grass tall enough to almost cover their backs. There were a number of places where the water had been flowing over the road. The water in the Somerset dam was higher than I have ever seen it. 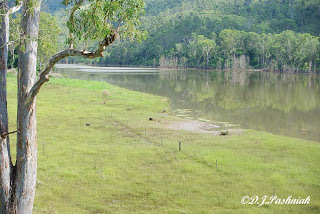 The Brisbane river has spread out across low lying paddocks and there is water where I have never seen it before. Just a couple of years ago the river at O'Sheas Crossing was reduced to a couple of puddles between the sand but now it is running bank to bank and we saw three Pelicans and a Cormorant swimming on the muddy looking water. 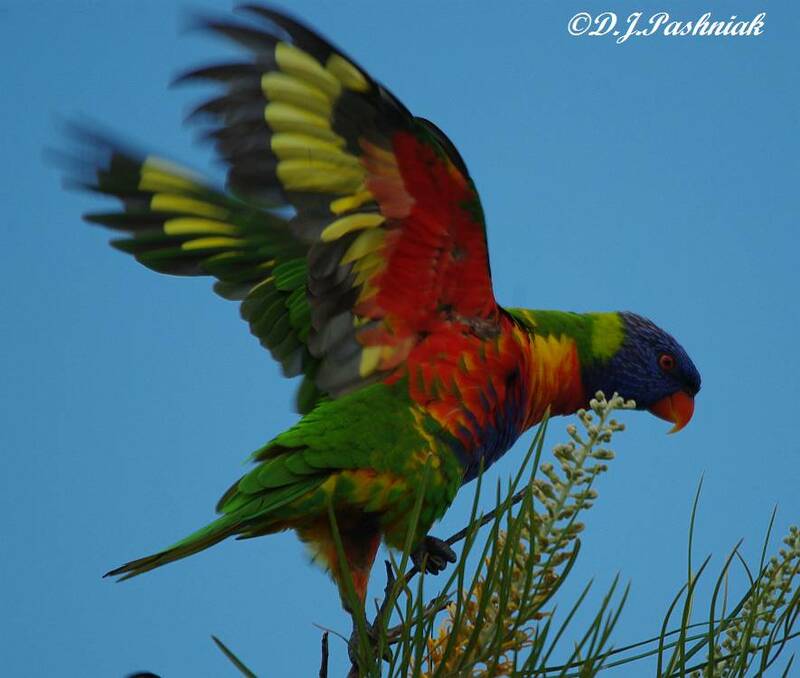 Thanks to all who have commented while I have been off-line and not able to see your comments or answer them. I am presently having a lovely time reading all the blog postings I have missed. I hope things are back to normal with my connection now.